Wordplay has been working with Greater Manchester Council for Voluntary Organisations (GMCVO) to help deliver their exciting Ardwick Green Histories Project. On Wednesday 29th October we hosted a heritage tea party where the residents of Ardwick Green shared their memories of the area through a range of creative writing and storytelling activities. Whilst enjoying a cup of tea and a slice of cake, we explored how people arrived and left Ardwick Green, the shops and entertainment venues they visited, and the people and places they went to for support in times of need. 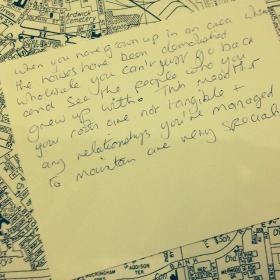 Participants used maps and photographs to write short poems and reflections on life in Ardwick Green as well as creating posters, personal journey maps and postcards.